The Hilleberg Tarp Pole is a lightweight, standing-height pole, carefully designed for use with both their tarps and their Altai tent. Thanks to a two-part bottom section with spring-loaded buttons, the Hilleberg Tarp Pole can extend from 186 cm to 214 cm in height, in 7 cm increments. When disassembled, it can be packed down to approximately 52.5 cm in length. It also boasts an interchangeable tip; by simply unscrewing and reversing the tip, the Tarp Pole can be used with either fabric pockets (such as on the Altai and Windsack), or with rings or loops (such as on the Tarps). 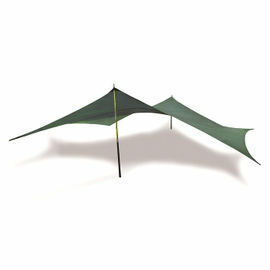 Hilleberg Tarp Pole is rated 5/5 based on 7 customer reviews. These poles facilitate tarpaulin use, particularly in open terrain, away from trees, where other solutions are difficult to find. At first sight they resemble tent poles. However they are intended to be used away from the supporting sleeves of a tent. Consequently they are stiff, unlike the flexible poles that are typically supplied with tents. In effect, they can support a roof, such as a tarpaulin, in much the same way that a column supports the roof of a temple. To do this, they have to resist forces that, if sufficiently large, will cause structural failure. The two most likely types of failure are bending and buckling. It is advisable to use them in a way that minimises the risk. To do this, they should not be heavily loaded, and not required to resist forces that are applied anywhere but at their tips. So, for example, applying a guy line half way along the length of such a pole will reduce the compression force required to induce buckling, and is therefore to be avoided. An obvious way to reduce the load on any one pole is to use smaller tarps and more poles. The variability of the forces experienced due to wind can be reduced by adding guy lines. Shortly after purchasing some equipment from Woodlore, I set up a Hilleberg tent and tarpaulin on the North York Moors in an exposed and quite windy spot. The tarpaulin was supported by four poles, and arranged so as to deflect the wind and provide shelter from rain. Each pole tip is provided with a 5mm diameter hole, which can take a suitable guy line. I found it better to transfer lines from the tarp to the pole at the tip, otherwise the lines tended to jam between the pole and the tarp rings. Other lines were added by looping around the tip and between the tarp and the line running through the hole. In a woodland setting, I would use slip knots and easily adjusted knots, but on the Moors I applied knots which were unlikely to shift as a result of the buffeting of the wind. Despite three days and nights of turbulent weather, nothing was damaged. Excellent design as you can expect from Hilleberg. Packs down to an easily manageable size, light but strong material. Great with large tarps. Adjustable height. Watch out in stronger winds you must drop height of tarp poles at least and maybe even remove poles and lower tarp altogether. I've had three of these poles bend and break in strong winds. Not cheap! The Hilleberg tarps themselves are pretty much faultless. Quality, functional piece from Hilleberg. I have used their products for over 20 years and have never been disappointed. Hilleberg quality, packs down well so easily stowed if you are heading off somewhere without handy trees. I bought two poles a year or so ago and they have been great. I've used them on several occasions in different applications when using the Hilleberg tarp. The more I use the poles and the tarp, the more I find more ways of using them and so, I bought two more! They are light and very versatile. The only downside is that they can be a bit too tall when using them with a divvy bag. Not a lot to say here really, it's a tent pole. However, as part of the Hilleberg Altai tent system it makes an awesome bit of kit. High quality as you would expect from Hilleberg.